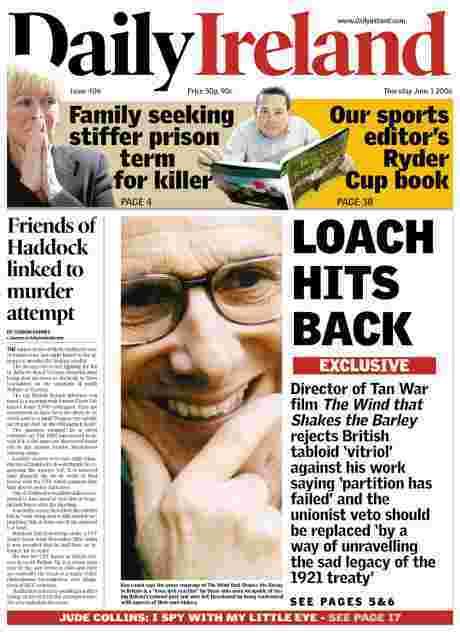 The acclaimed film-maker Ken Loach yesterday hit back at British press criticism of his award-winning film on the Tan War. Speaking exclusively to Daily Ireland last night, the 69-year-old director said some of the criticism had been of an “amazingly vitriolic and personal nature”. He said it had been movitated by a “deep-seated imperialist guilt” over the partition of Ireland and the subsequent years of conflict that had resulted. The Wind That Shakes the Barley won the prestigious Palme d’Or award at the Cannes film festival last Sunday but was savaged by several tabloid newspapers this week. Mr Loach was accused of propagating anti-British sentiment. 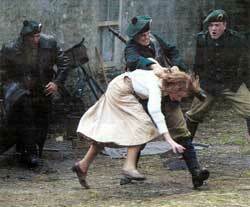 The film depicts events during the IRA’s guerrilla campaign against British rule during the 1920s. It stars Cillian Murphy as an Irish medical student who takes up arms against a reign of terror by the Black and Tans, the notorious auxiliary force sent in to quell calls for independence. On Sunday, a nine-person jury at Cannes, headed by the Chinese director Wong Kar-wai, returned a unanimous decision to give the top award to the director, who had previously been nominated on seven occasions. Mr Loach also drew parallels between what was depicted in the film and the current occupation of Iraq. A series of vitriolic attacks on the director by several right-wing tabloids followed. The Sun said the film had a plot “designed to drag the reputation of our nation through the mud”. “It portrays British soldiers as trigger-happy mercenaries hooked on torture, burning cottages for kicks and using pliers to rip out the toenails of innocent Irish victims. “At the same time, cold-blooded republican butchers star as figures of heroic bravery,” wrote columnist Harry MacAdam. The Independent said the film’s graphic depiction of the Black and Tans had “come across like a recruiting campaign for the IRA”. Ruth Dudley Edwards, writing in the Daily Mail, accused the director of contriving to portray the “British as sadists and the Irish as romantic, idealistic resistance fighters” to suit a political agenda. 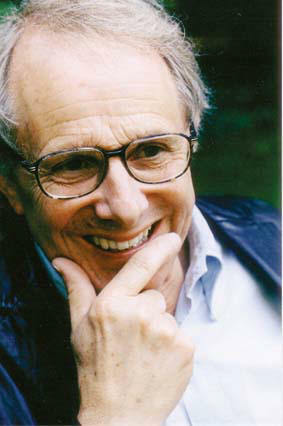 Mr Loach said the criticism had not once challenged the veracity of the film. “Not one of the criticisms managed to directly challenge the script’s content. It was instead based on vitriolic personal attacks and inaccuracies,” the director said. Mr Loach said the press coverage had been a “knee-jerk reaction” by those who were incapable of facing Britain’s colonial past and who felt threatened by being confronted with aspects of their own history. “Exposing colonialism in its brutality is something the British ruling class react violently against. Guilt is embedded deeply in the consciousness of the political class,” Mr Loach said. He added that Ireland held a special place among the colonies because society was still living with the legacy of colonialism and this also accounted for the media reaction. “People can only understand the conflict in the North by understanding its roots in the Treaty. Once people do, it makes it harder for others to represent the Irish conflict as a case of ‘the Irish just can’t get along’. It may account therefore for some of the press hostility,” he said. When asked whether a British prime minister should publicly renounce, on behalf of the government, Britain’s colonial history as being wrong in principle, Mr Loach replied: “They are incapable of doing so. Imperialism is in their blood and their words do not mean much of anything. However, the film director said the British government should openly acknowledge the failure of partition and work towards dismantling the unionist political veto over change in Ireland. “Partition has been a failure. It has resulted in decades of political strife and death. It created a failed statelet. “The British government should publicly acknowledge this and work towards unravelling the mess it created. The unionist veto on change must be removed. This must be achieved reasonably but certainly it must begin with an acceptance that partition has failed,” he said. More that they are force fed with her brand of nonsense and have been for a long time with no alternative view allowed .
. The influence the like of herself , the cruiser , Harris and British Lord and oil robber Tony OReilly have had on Irish media and current affairs ( alongside decades of Draconian section 31) has had an extremely negative effect on Irish democracy , dangerous to beyond the point of subversion. Ken Loaches film has the potential to begin unravelling these peoples lifetimes work . Expect more hysteria along these lines . Fintan OToole may well join in too given his track record . It's interesting to see that a real Englishman like Ken Loach had the decency to turn down an OBE (order of the British empire) while a fawning native Irish sleeveen like Tony O'Reilly proudly flaunts his Imperialist bauble at every opportunity. It's ironic that it took an English filmmaker to start putting the truth about Irish history on our screens. By the way it really is eccentric that Ruth Dudley Edwards can call anybody eccentric. 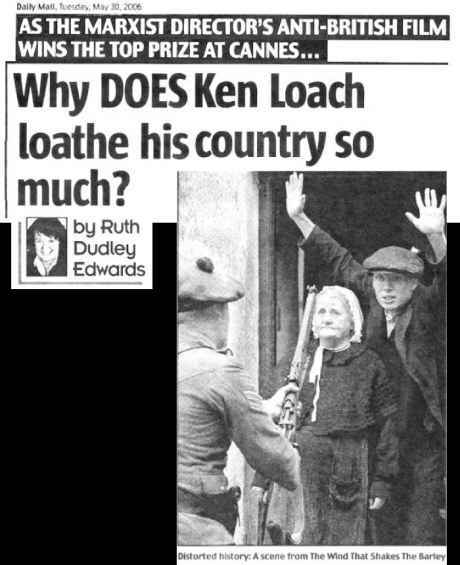 Whereas the London edition of the Daily Mail gave only the Ruth Dudley Edwards hatchet job verdict on Ken Loach’s film The Wind that Shakes that Barley, the ‘Irish’ edition decided to ‘balance’ matters by giving Ruth another go. PREDICTABLY, Ruth Dudley Edwards who just last month said 'we should be ashamed of our President, our Taoiseach and every other person who praises the people of 1916' now trains her sights on the intuitively political director Ken Loach for his intention to make the British confront their imperial history. His film, winner of the Palme d'Or at the Cannes Film Festival, tells the story of the Anglo-Irish War and invites comparison between the Ireland of 1920-22 and present-day Iraq. Miss Dudley Edwards baldly states: 'The truth is that, as empires go, the British version was the most responsible and humane of all. 'With all its deficiencies it brought much of value to most of the countries it occupied. Also, it all happened a long time ago and no one should be forced to apologise for it.' In Ireland, the 'much of value' of which she speaks includes the Famine and, in fairness to Tony Blair, one of his first gestures on taking office was to apologise for Britain's role in it. But the legacy of empire also includes the Black and Tans, the specially recruited corps of exsuch-servicemen who, during the period Loach covers, were sent to Ireland to make it 'an appropriate hell for rebels'. The gusto with which they carried out their task has made their name a synonym for infamy. It seems to me that Mr Loach would have faced a very difficult task had he tried to make the Black and Tans out to be a bunch of loveable lads. They were a major part of a British policy which at the time was known as 'frightfulness'. In attacking both the commemoration of 1916 and a film which portrays the Irish War of Independence in a favourable light, Ruth Dudley Edwards is herself pursuing an agenda at least as assiduously as Ken Loach. If, as she says, his is Marxism, then hers is Crypto-Unionism. The fact is that were it not for 1916 and the war which Loach has dramatised, Ireland today would still be a handout economy, like either Wales or Northern Ireland. It was the securing of independence which enabled it to join the EEC and make crucial decisions as the investment in education-which led to the Celtic Tiger. The core reality behind 1916 and the Anglo-Irish War is that the forces of imperialism led to both occurring. In seeking to concentrate the debate on the shortcomings of nationalism, it is perilously easy to overlook the existence of a very large elephant in the political drawing-room. This elephant lumbered into view with the words of Randolph Churchill ringing in its ears: 'Ulster will fight and Ulster will be right.' That statement was the enunciation of a policy whereby, to defeat the Liberals, the British Conservatives went into partnership with the Ulster Unionists to subvert the will both of their own government, and of the ballot box, which had given overwhelming majorities in Ireland as a whole for Home Rule. The road to 1916 and to the subsequent War of Independence was paved by the Conservatives and the Unionists. Their sympathisers in the British army and navy made sure that the services could not be relied upon to enforce the will of the ballot box and by way of putting muscle into the Unionist defiance, gun-runnings were staged while the police turned a collective blind eye. In the fury whipped up by the anti-Home Rule campaign, the Ulster Volunteers were founded and it was only then that the question of an armed response by the nationalists to these happenings became a realistic prospect. The Irish Volunteers were founded in Dublin to defend Home Rule against the undemocratic forces ranged against it, and a few years later the Irish Republican Brotherhood was able to use a tiny segment of these Volunteers to stage the 1916 Rising. An unpalatable fact which neither Unionists nor Conservatives like to hear mentioned is the effect of all this in creating the First World War. There was an opinion amongst the German elite that the opposition to Home Rule had so divided England that she could not attempt to fight a war. However, the Unionists and Conservatives' line today is that the treacherous Irish helped the Germans by staging the 1916 Rebellion and the Anglo-Irish War became inevitable after the 1916 leaders were executed. And so we come to the subject of Loach's film. While it is set in the 1920s, it is no harm to remind ourselves that history repeated itself in the mid-Seventies. A power-sharing executive, which had been set up in Belfast, was brought down by the Unionists, who blocked every road in the Six Counties and commandeered electricity and petrol supplies. The British Army stood idly by while they did so, neutral against the nationalists. As this is being written, Unionist intransigence is again preventing a power- sharing executive from being set up under the terms of the Good Friday Agreement of 1998. Unquestionably, a majority exists in the United Kingdom, and in Ireland as a whole, for a peaceful resolution of the 'Irish Question'. Unquestionably also, the Unionists' allies in the Conservative Party and the armed forces are but a pale shade of orange compared to the virulent hues of the 1916-21 period, or even of the turbulent Seventies. But the hand of history still hangs heavily over Belfast, as it does over Baghdad. It does no service to the democratic majorities on both sides of the Irish Sea to debate issues such as Ken Loach's film, or 1916, in narrow terms. Mr Loach is to be stigmatised, apparently, because he shows Irish nationalism in a favourable light but the day is long past when a thought-provoking film such as The Wind That Shakes The Barley can simply be rubbished in condescending tones by a Unionist apologist. The Americans, in Iraq, have stepped into the shoes of empire once worn by the British, and we can see the consequences on our television screens. If Mr Loach succeeds, through his use of the Irish issue, in helping to force a rethink on U.S./British policy in Iraq, then he will have done us all a service. Gordon Brown, 2005: "I've talked to many people on my visit to Africa and the days of Britain having to apologise for its colonial history are over. We should move forward. "We should celebrate much of our past rather than apologise for it." There's good money to be made by being an apologist for British imperial mass murder and robbery - if Ruth Dudley Edwards, Roy Foster, Eoghan Harris, Kevin Myers, ect. werent rolling in this dirty money some other mercenary hacks would fill their places. The Dud is single-handedly boosting Ken Loach's film in Ireland. The reverse weather vane effect ensures that The Wind that Shakes the Barley will become popular wherever the Dud’s views are known and derided. The PR matron of the Orange Order and the British Foreign Office ploughs on regardless of the distance between her views and reality. Not only is Dud doing her best for the Irish republican cause, she is now boosting Marxism – people read her deranged thoughts and wonder, ‘what is this body of thought that inspires so many powerful films’? Thank you Fudley. Keep it up. Without such figures of fun, life would be exceedingly dull. at long last Ken has won international establishment recognition for his work. Even RTE phoned him up for an interview, with only a shortened sentance obliquely referring to the "overtly political nature" of his films. Some people point out the legacy of partition, grounded as they are in the persistent belief first suggested in 1912, that a Northern Ireland state would be "impractical", thus it would have to be 6 rather than 3 counties. Of course since 1922 & its offers of a border comission, through the 60's to the "Ireland Forum" of the 80's, the little statelet appeared never to founder on the impracticality of its size. But I wonder how many Irish people ever wondered at the "impracticality" of the 26 county Irish Free State or later Eire state? I read with interest a selection of US media clippings on the recent vote for independence by Montenegro this week. They had been compiled by a friend with whom I work on a bilateral basis as translator. She's the grand-daughter of one of the heroes of the Spanish civil war, indeed her grand-father is one of the characters in an earlier work by Ken Loach. "tierra y libertad". Her grand-father was what in common Irish parlance would be called a "clever skanger". It was the secret of his life which brought him to the front, and then brought him through mostly self-education to becoming one of the most respected members of his nation's academia. He died one of the few to recieve the highest honour his nation's government (the Catalan generalitat) could bestow. His grand-daughter nor her parents could ever be described as "skangers". But the class conscienceness remains. She had highlighted these certain sentances of the last weeks' paragraphs of US media comment on the Montenegro independence vote, which caused excitement in other nations where "indepenedence" is a recurrent theme (Euskal Herria, Catalonia, Quebec, West Vlaanderen). And the highlighted paragraphs were those which referred to in one way or another a misconception common in the USA "that small states produce better democracy, there being less people, the government must be closer". The character's his scriptwriter Paul Laverty chose to carry the story of our war of independence, partition and civil war were......................... "too middle class". are the six counties really a failure ? It depends on which side your'e coming from. To say that the six county statelet has " failed " is to presume that it was set up to resolve the national question in the first place - which is not the case. British imperialism divided Ireland so as to control it , wanting neither a workers' republic nor an independent capitalist rival on its doorstep. From Britain's point of view partition has been entirely successful . Ken Loach is right when he points out the futility of asking the British government to renounce its colonial history -especially at a time when Britain is embarking on new imperialist adventures in Iraq Afghanistan and Iran - but , like Sinn Fein , he is mistaken if he believes that Britain could ever begin to “work towards unravelling the mess it created” in Ireland .That’s for us to do -us ourselves. well does the north give free school dinners? have heart care? free schoolbooks? or hospital beds? I shot myself in the kneecaps. Simply by respecting our right to national sovereignty and decalring its intent to withdraw in an orderly and controlled manner . I believe we as a people are more than capable of resolving the mess Britain created without its destabilising influence and threat of overwhelming firepower . Perhaps we could discuss some of the points raised by Ken Loach and others who made the film - for example, on the relationship between stories set in the past and what is happening today - rather than accumalate a tedious "Shock Horror" tirade against ranting right-wing ideologues - ilke Ruth Dudley-Edwards? What, you mean you are against personalised attacks of the type that Ruth specialises in. Don't you think she would benefit from a taste of her own medicine? Anyway, instead of giving us the benefit of your advice as to what you think we should be writing here, why not go ahead and just write it yourself. Nothing stopping you, is there? Questioning the revisionists and pinpointing the tangled knots they get into has a value, don’t you think? After all, they all support the occupation of Iraq and condemn Ireland’s war of liberation. Nothing wrong in pointing that out, is there? It indicates a relation of past and present. Happy with that? Anybody wanting an insight into how former revolutionaries are used by reactionary political forces against their former comrades should see Loach's film "Land and Freedom " . It’s about the betrayal of the Spanish revolution .I haven't seen The Wind that Shakes the Barley yet , but I wouldn't be surprised if many provos find themselves embarrassed watching it for the same reasons as Mick O'Riordan was appalled by “Land and Freedom”. Ken Loach's new contribution to 'Irish' cinema received the highest accolade for a film, the Palme d'Or award at the Cannes Film Festival last Sunday. It was justly deserved. In The Wind that Shakes the Barley, Loach tackles the Tan War and the Civil War warts and all, no holds barred. The brutality, the viciousness of those wars is there for all to see, for all to take sides. In a faithful portrayal of life in rural Cork during those momentous years, Loach manages to get across the heartache, the pain, the comradeship, the betrayals, the loyalty, the sacrifices that ordinary men and women made for the cause of Irish freedom, then and obviously since. This is about the mothers, sisters, brothers, friends and comrades, the ordinary men and women who lived with the consequences of their decision to challenge the might of the British Empire in the "hope this Ireland we are fighting for is worth it", and how they dreamed that it wasn't just a fight for a green flag replacing the Butcher's Apron. The stark brutality of the British war machine in Ireland is vividly captured- the torture, gratuitous violence and vindictiveness of previously demobbed English soldiers who had survived the Somme but who had been brutalised by the experience, let down by their government on their return from the front, and many who were just plain depraved. The cast, through their great performances, brought to life many of the aspects of the revolution of that period that are forgotten in most other retellings of the era, which almost exclusively concentrate on the military aspect of the war. The Dáil Courts, the courageous stance of rail workers refusing to transport British soldiers or their munitions across the country, the land seizures and conflicts, the role of the ascendancy landlords, the confusing world of the informer, the intensity of the reprisals are all part of the patchwork of this powerful film. It is a film that some will not like. Fine Gael Senator and anti-republican mouthpiece Brian Hayes watched the special showing at the same time as myself. He was not impressed. It didn't show the politics of the time, he said later. Obviously he watched a different film to me. His discomfort with the film and its accurate portrayal of war and revolution in Ireland in the 1920s should be endorsement enough for republicans to go see it when it hits the cinemas here. This is a film, not a documentary, but it will cause a welcome, honest debate on what happened in that era will explain a lot about today's society North and South. The film explains quite well how the money, the Church and the reactionaries lined up together with the support of the British to defeat the Republic in 1922. For republicans, nationalists, unionists, West Brits, students of Irish history, those interested in conflict, those interested in a good, action-packed movie this is a must see film. It highlights how ordinary men were shaped into soldiers by extraordinary circumstances, how republicans enjoyed the electoral and tacit support of the community. The storyline weaves the history of the time around the lives of young men and women in a County Cork village and how the events of the time moulded them, in particular two brothers who end up at opposing ends of guns during the Civil War. It movingly portrays the sadness and hurt of war and it doesn't shy away from showing the cruel deeds which war necessitated on the republican side. It is an honest and impressive piece of work from a director who is regarded as controversial because he depicts events from a different angle- that of the underdog. Enjoy! Disappointed by a review ?I don't think so Owen . As a matter of fact, it's exactly what I'd have expected from Aengus O’Snodaigh T.D. As far as reviews go , I wouldn’t exactly say it deserves the highest accolade though -The Palm de Plomb perhaps. Interesting that Aengus saw the film at the same time as Brian Hayes .I wouldn’t be surprised if they shared a bag of popcorn . They’re well used to sharing from the same trough after all.. They should have taken you-know-who along to throw some light on “the confused world of the informer” after the special showing. Two TDs, one film, two views - what is your problem? The two TDs were asked to review the film for RTE's ‘The last Word’. The Blueshirt was the disappointed one, while the Sinn Fein TD pronounced himself very pleased with the production. You resort to irrelevant abuse after your prediction was disproved - sign of a weak argument. If Ireland was closer today to its revolutionary potential in the early 1920's, would US troops be allowed use Shannon Airport, a staging post on the way to causing imperialist murder and mayhem in Iraq? "An unpalatable fact which neither Unionists nor Conservatives like to hear mentioned is the effect of all this in creating the First World War." absolute nonsense, Germany didnt consider the British would enter the war because they thought that there was no way they would risk such a war over the sake of either France, or for the sake of the neutrality of Belgium, the Netherlands, etc, as guaranteed in the Treaty of London. Wherever you stand on the British Government, you cant make up history. As a republican, i still would have to say that the film is historically revisionist, and it does a disservice to the republican campaign today to try and distort history so. bad things were done by both sides, but the difference is that whilst the Black and Tans did so, it was outwith what they were ordered to do, and actually the lots of the Brits, including the King, and some major politicians, not least Lloyd-George, were actively protesting every bad done by them, whereas the IRA more or less ran on a policy which justified these actions as necessary. I may be a republican, but we still have as much to apologise for in that war, not doing so just allowed the likes of the Provos to continue the violence, and allows the RIRA, and CIRA, to try and do so.